The second box set from the Kids Praise Party vault, featuring 3 brilliant albums. Kids like to praise and this bumper box will get the party started! Bringing together albums 4, 5 and 6 in this popular series, it offers scriptural themes, plenty of variety and oodles of quality at an affordable price. This box set zooms into top gear with a combo of well known worship songs from the fast to the fantastic. An amazing collection of thirst quenching tunes filled with the great news of Jesus! All of this from the UK's top children's writers, including Doug Horley, Nick & Becky Drake, Vineyard, Simon Parry, Hillsong Kids and Dave Godfrey. 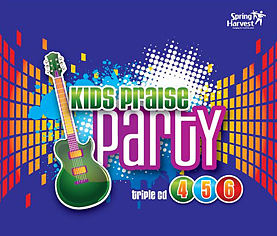 Kids Praise Party Boxset 4-6 by Spring Harvest was published by Essential Christian in April 2012 and is our 15514th best seller. The ISBN for Kids Praise Party Boxset 4-6 is ELE1750D. Be the first to review Kids Praise Party Boxset 4-6! Got a question? No problem! Just click here to ask us about Kids Praise Party Boxset 4-6. I would like to know if these cds come in 3 separate cd cases (albeit in an overall cover), as I intend to split them (rather than in a single 3 way case) Thank you. A:The CDs are three separate cases presented in a cardboard sleeve. Thank you for using the Q&A Forum.